Other photos: Aft Deck, Aft Deck Dining and Seating, Salon, Salon with Dining Table, Dining for 8 People, Salon, Salon TV and Bar, Galley, Galley, Hallway with Day Head, Sten Cleats with Capstan, Sunpad, Bow Storage, Aft Deck Storage/Shower, Dual Anchor Windlass, Aft Deck Engine Controls, Hi-Lo Bridge Instrumentation/Controls, Flybridge BBQ, Sink, Ice Maker and Refrigeration, Side Boarding Gates with Tide-Ride, Sunpad with Jacuzzi and Seating, Helm Station, Flybridge Seating, Flybridge Dining and Seating, On Deck Master Stateroom, Master Stateroom, Master AV System, Master Sink and Shower, Master Head, Full Beam VIP Stateroom, VIP Stateroom, VIP Sink and Shower, VIP Walk-in Closet, VIP Head, Starboard Guest Stateroom, Guest Stateroom, Guest Staterooms with Pullman Berth, Guest Head and Shower, Portside Guest Stateroom Converts to King Size Bed, Portside Guest Stateroom Head, Pilothouse, Side Deck, Transom Platform, Switch and Pump Room, Engine Room, Generator Room, Garage and Beach Club AV System/Refrigeration, Garage and Beach Club, Transom View, Profile. Enter her salon through two large sliding glass doors from the aft deck. Her master suite in on the main deck with three guest staterooms below for a sleeping total of ten. The salon / dining salon is serviced by a galley to port side. There is a sliding privacy door from the galley to the salon. The crew accommodations are below forward and are comprised of a lounge area, captain stateroom and a twin crew stateroom forward. 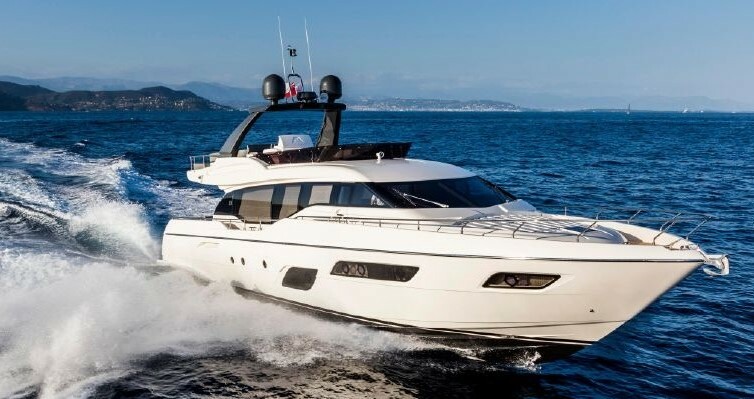 The pilothouse is one half deck forward of mid-ship with passage to a large flybridge deck with helm station. The aft main deck has a teak table with storage and offers seating for 8 to 10 guests. The engine room has an auxiliary control room adjacent to a large lazzarette/tender garage with a drop transom for great water access for swimming, diving or tender boarding. This garage also functions as a Beach Club with SAT TV/Stereo entertainment center, Sub-Zero refrigeration. Her 2015 interior upgrades for the Custom Line 94 define the epitome of sleek Italian design and brings in old world classic. The wall paneling and leather covered built-in furniture are furnished in hand-selected cherry and burl veneer finished in a mirror-like gloss. Lounges, chairs and headboards are upholstered with the finest grade Italian leather. The galley work surface is granite and lacquered cabinets. All heads have full showers with lacquered cabinetry and paneling are complete with marble soles and vanity tops. The overheads are intricately designed and finished with Alcatara suede and are trimmed in gloss cherry and burl.